Back in the late 80s and early 90s Kelly Keagy, Mark Slaughter, Eric Martin, and the brothers Nelson were all fronting their own hugely successful rock acts – Night Ranger, Slaughter, Mr. Big and Nelson. You may recall a few of their mega hits that are still in regular rotation in most rock radio stations – “Sister Christian”, “Fly to the Angels”, “To Be With You”, and “After the Rain”, just to name a few. Well, the decade may have changed but the music hasn’t, they are just bringing it to us a little differently these days. 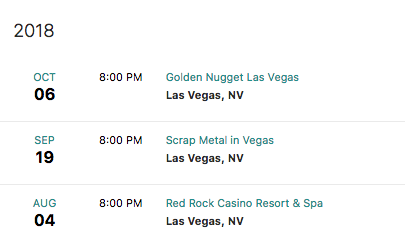 SCRAP METAL is the ‘rock and roll rat pack’, a confederacy of multi-platinum artists from the 80s Arena-Rock generation who took over MTV and held the airwaves hostage for a decade. These ‘scraps” from all the various top bands create a surprising mix. “You’ve got different people coming from different kinds of bands, but I think this really works – it fits well,” says KELLY KEAGY. SCRAP METAL was created by GUNNAR NELSON, who with twin brother MATTHEW NELSON was half of the hit 90s group NELSON, and MARK SLAUGHTER of 80s rock group SLAUGHTER. 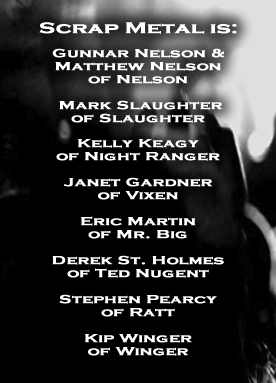 KELLY KEAGY from NIGHT RANGER helps to round out SCRAP METAL’s core group, along with ERIC MARTIN of MR. BIG who brings his trademark powerhouse pipes to the band. SCRAP METAL’s only similarity to other ‘supergroups’ is that it is a collection of superstar icons… but that’s where any similarities end. “We’re all about the music, we’re about the fun, and we’re about getting people to have a good time – to forget their problems, to unleash a party that’s wild and crazier than they’ve ever seen and that’s the key,” enthuses MARK SLAUGHTER. SCRAP METAL features all lead singers and front men who were ‘the’ voices and faces of rock’n’roll in America for the good-time rock generation. These are the actual lead singers of such #1 hits as “Sister Christian” (NIGHT RANGER), “(Can’t Live Without Your) Love and Affection” (NELSON), “To Be With You” (MR. BIG) and “Up All Night” (SLAUGHTER). 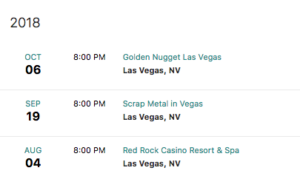 SCRAP METAL is unique since concert shows always feature an element of surprise with special guest performances — everyone from Joe Lynn Turner of DEEP PURPLE, to C.J. Snare of FIREHOUSE. Visit scrapmetalrocks.com for more info. OVER 50 MILLION RECORDS SOLD WORLDWIDE!